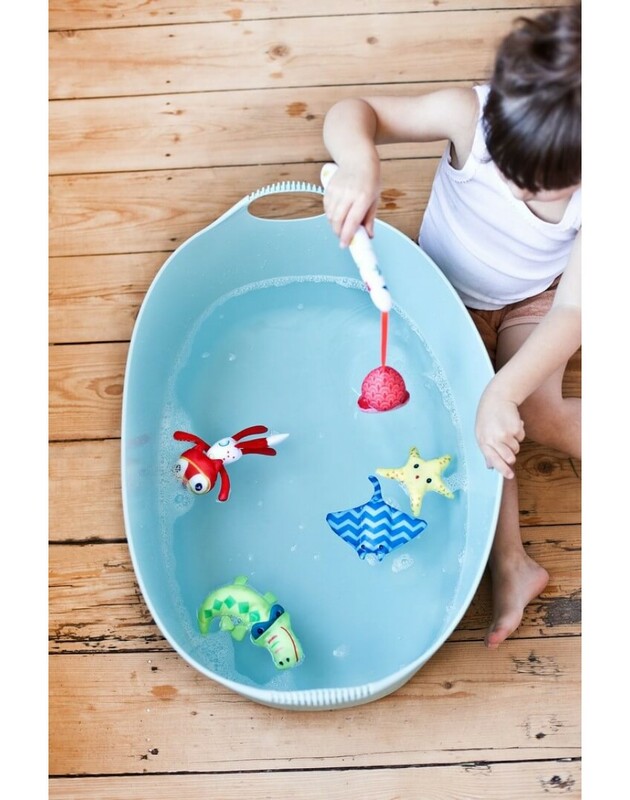 This funny fishing game Alice gives your big darling a "smashing" bath time! 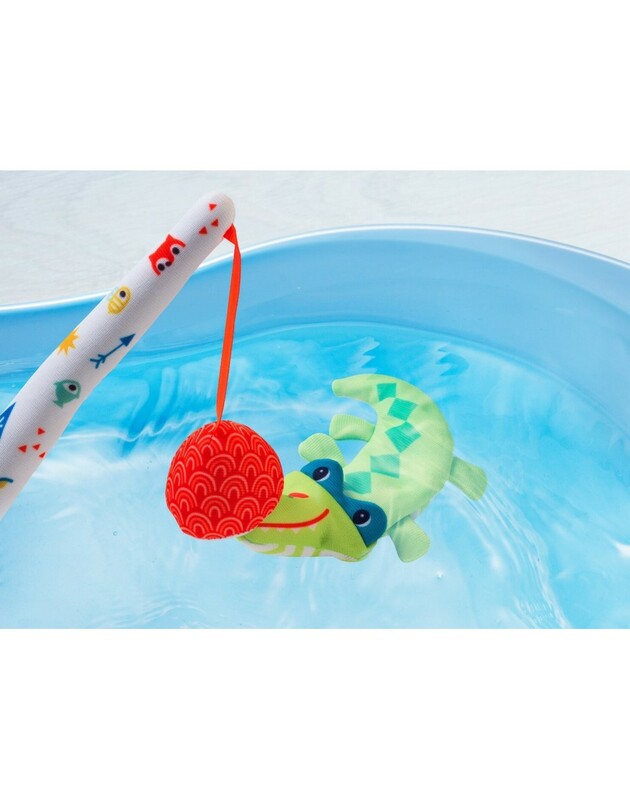 See how quickly his fine motor skills improve, thanks to the magnetic rod with which it fishes all kinds of animals. And then count the catch! 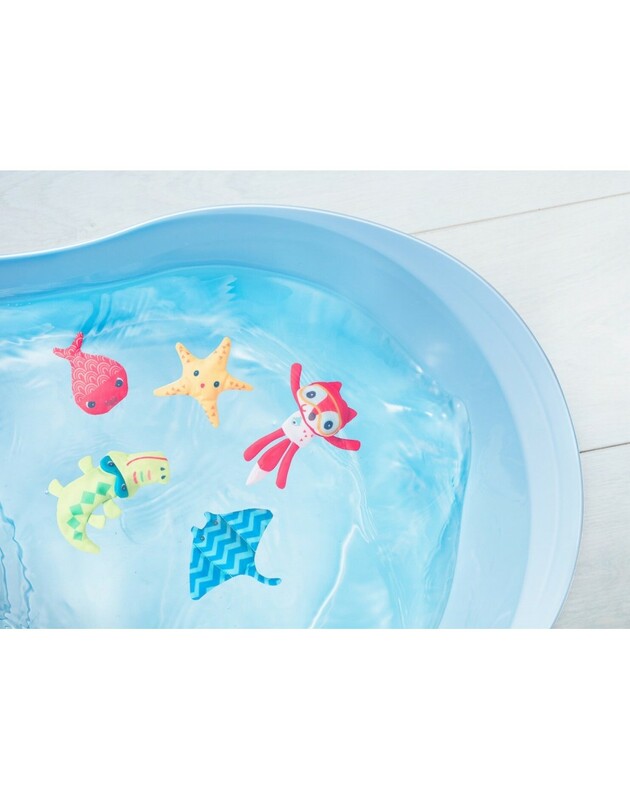 Let your little one crush in the bath. 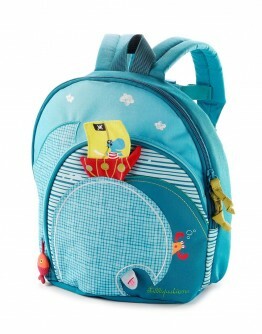 LilliputiensLilliputiens Arnold backpack hippoWith Lilliputiens Arnold backpack each trip will be a real adventure. 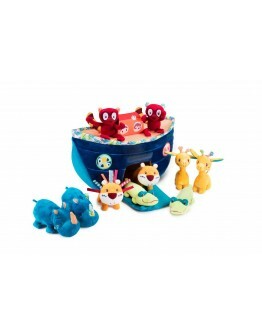 In the many colorful boxes you can get all your goodies pack neatly. A backpack with adjustable straps, a large front pocket and internal pocket with zipper. Ability to address data. 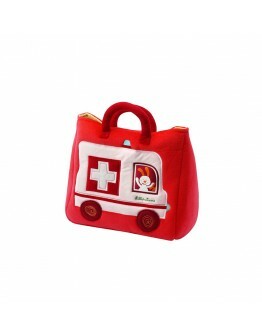 All bags and school bags from Lilliputiens are water resistant. 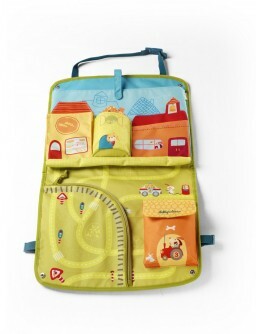 Starting from + 2y Size 25 x 25 x 13 cm Material 100% polyester Washable at the surfaceLOOKING FOR THIS LILLIPUTIENS ARNOLD BACKPACK HIP..
LilliputiensLilliputiens storage panel farm LilliputiensLilliputiens storage panel farm. 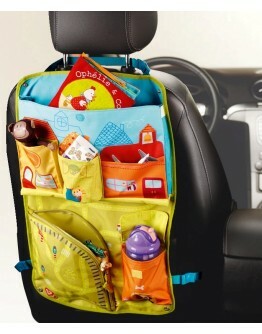 This colorful storage Panel is easy to confirm on the car seat. It contains a lot of great and small boxes to storage the stuff of the small passenger. Your great treasure will always have his favorite toys on hand during car rides. Fun guaranteed! Arrived at destination the panel can in an instant be taken with you. 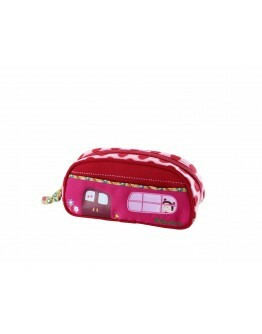 All bags and school bags from Lilliputiens are water resistant. Starting from + 0 m S..
LilliputiensLilliputiens seek and hide AliceLilliputiens seek and hide Alice Where is Alice, the cute fox? Peekaboo ... Alice is a puppet and appears suddenly between the leaves to say hello and wishing your a good day to say. Look! 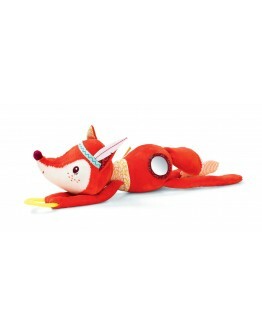 Simon the Hedgehog, the rabbit and the babyfox are as finger players hiding in the bushes. Can you find them? Each character has their own sound so you can identify them better (paper sound, bell, beep). 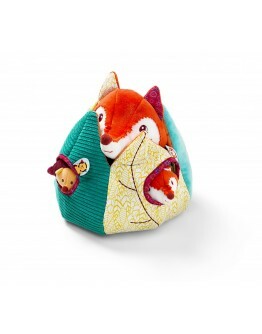 Play and have fun!Starting from + 6 m Size 19 x 32 cm Material..
LilliputiensLilliputiens pillow cuddle activity fox AliceLilliputiens pillow cuddle activity fox Alice. Lying or sitting what do you prefer? 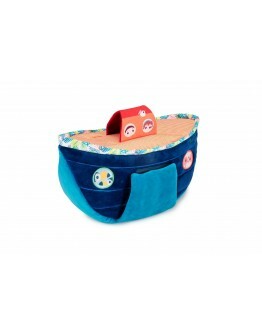 Your baby will get all the comfort at Alice, the soft cushion activities. 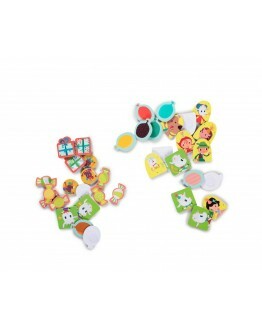 Paper sound, beep, bell, mirror, teething ring ... 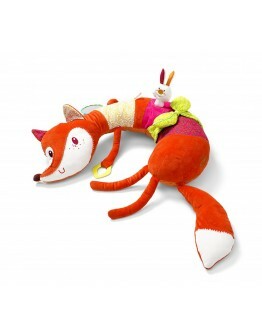 The fox with the soft fur is full of surprises to your little one. 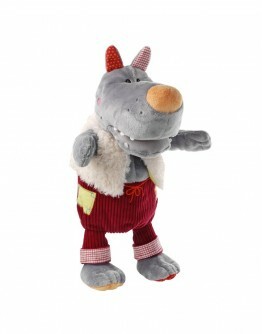 From + 3 m Size 50 x 55 cm Material 100% polyester Machine washable 30 ° (delicate cycle)LOOKING FOR THIS LILLIPUTIENS ALICE PILLOW OR ORIGINAL TOYS - EDUCATIVE TOYS ..
LilliputiensLilliputiens doll Nicolas the wolf and the 3 little pigsLilliputiens doll Nicolas the wolf and the 3 little pigs A fairy tale told from generation to generation, a model of courage. 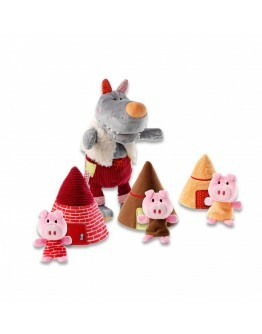 A story that helps children overcome their fears: 3 little pigs (finger dolls) defy the big, bad wolf (hand puppet). Once the fairy tale ended, cottages and piglets safely stowed away in the belly of the hospitable wolf. 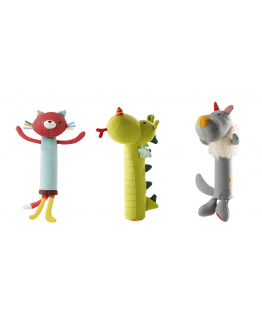 Starting from + 9 m Dimension 30 x 16 x 20 cm Material 100% polyester Machine washa..
LilliputiensLilliputiens nodding rattleLilliputiens nodding rattle. Move the head of Nicolas de wolf and you hear the sound of a bell. 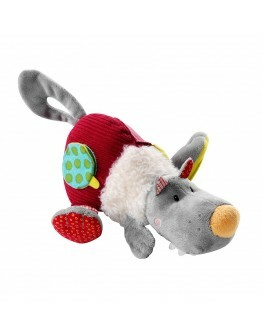 Squeeze into it with your hand and he does "Squeak"! 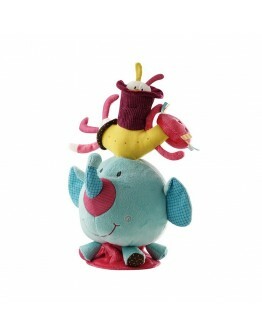 Each animal has its own sound and/or bell. 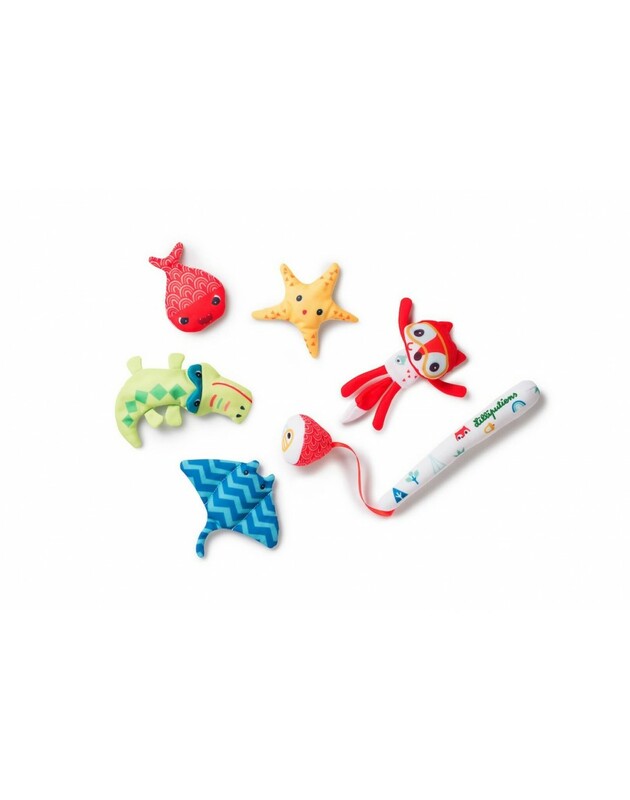 Starting from + 0 m Size 6 x 25 x 4 cm (depending on animal slightly smaller or larger) Material 100% cotton Washable at the surfaceLOOKING FOR THIS LILLIPUTIENS RATTLE OR ORIGINAL TOYS - EDUCATIVE TOYS - TOYS FOR EVERY AGE - FUNNY COLORFUL HUGS OR DOLLS FOR THE MORE R..
LilliputiensLilliputiens action wolf NicolasLilliputiens action wolf Nicolas. 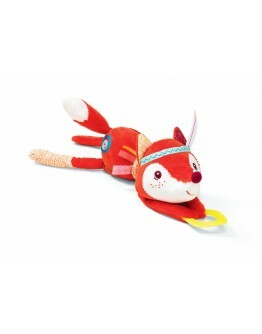 Nicolas the wolf has more than one surprise in store for you! 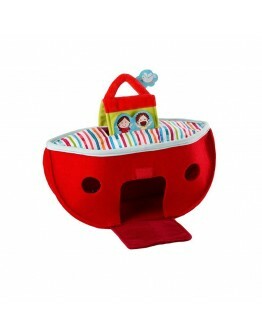 Take it down and discover its many activities: a rattles sound here, a paper sound there, a mirror under his foot, a secret hiding place for little red riding hood ... Nicolas has also a pacifier holder in his pocket so you can not get rid of him. 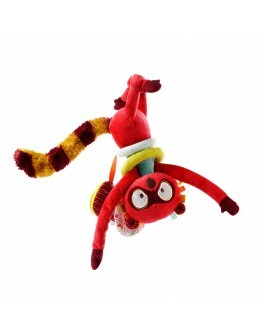 From + 3 m Size 24 x 12 cm Material 100% polyester Machine washable 30 ° (delicate cycle)LOOKING FOR THIS LILLI..
LilliputiensLilliputiens Georges action makiLilliputiens Georges action maki. Make Georges on to the maxi-cosi using his big legs. 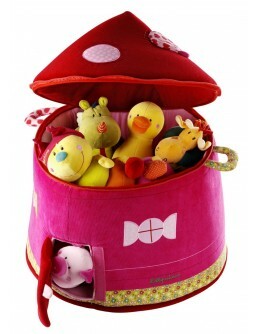 Around its bodice offers a host of activities such as a crackling tail, a mirror, a rattle to entertain you during your trips. 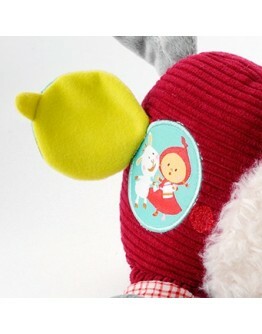 Starting from + 0 m Size 30 x 20 cm Material 100% polyester Machine washable 30 ° (delicate cycle)THIS LILLIPUTIENS GEORGES ACTION MAKI IS A COLORFUL CUDDLE FOR EVERY BABY. 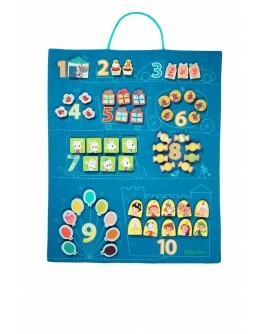 LOOKING FOR EDUCATIVE TOYS - TOYS FOR EVERY AGE - FUNNY SOFT H..
LilliputiensLilliputiens Arch of NoahLet all these Lilliputiens Arch of Noah animals, get on the arch side by side and by two and let them find shelter during the great storm surge. And this while Noah looks at all animals. 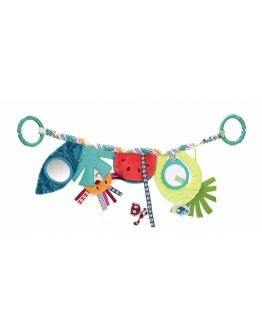 This Arch is out of collection - You can buy the new model Arch of Noah blueThis Noah's arch with animals is easy to carry by your little one. It has a convenient handle and open the boot easy aside. There is also a mirror present. 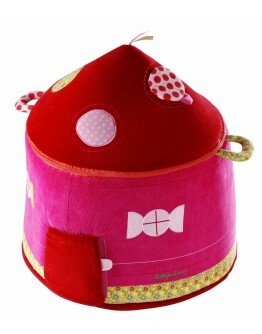 Starting from + 9 m Size 36 x 15 cm Materia..
LilliputiensLilliputiens the farmThe Lilliputiens farm is a portable house that you can easily take with you when you go out with your little one. 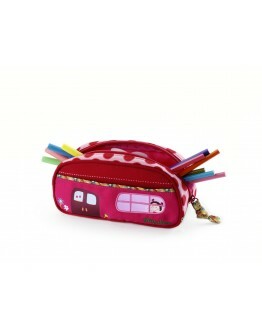 On holiday with grandmother or grandfather on, your big treasure carries this farm easily thanks to the handle. Farmer Jan lives on the farm together with all his friends including Jef the dog, Vicky the cow, Ophélie the chicken, Nicky the duck, a little sheep and pig. 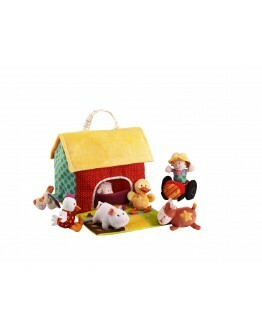 Pull open the door of this beautiful farmhouse and discover the atmosphere and atm..
LilliputiensLilliputiens doll Nicolas the wolf and the 3 little pigsLilliputiens doll Nicolas the wolf and the 3 little pigs A Bunny is sick! Quickly get the doctor, because our bunny is sick! She probably ate something wrong. Get your doctor's bag there, and put on your doctor's coat, look at bunny's health book and examine her with the stethoscope, breathe in and out. 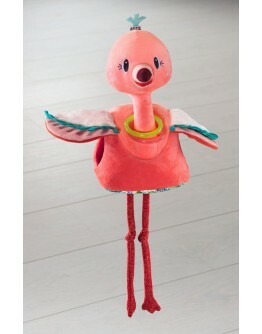 Now a syringe and bandage and voila Bunny is healed.Starting from + 6m Dimension 23 x 27 x 15 cm Material 100% polyester Machi..
LilliputiensLilliputiens Anaïs and her baby'sThese Lilliputiens flamingo Anais and her three babies are the cutest chicks ever seen. They are all tinted pink and each chick has a different function that your little one can play with to your heart's content. There is chick Anneke who produces real chick sounds, André has a mirror where your little one can discover himself and the third chick Angel serves as a teether.Mama flamingo Anais crackles, rattles and has rings around the neck.A sweet toy ..
LilliputiensLilliputiens Georges activity makiLilliputiens Georges activity maki. Georges de maki is a super fun and soft hug. 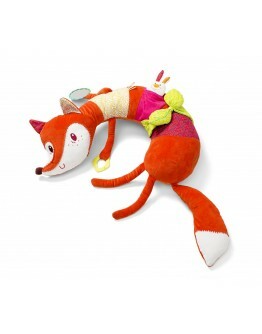 He is colorful and makes your little one laugh quickly! Let your baby or toddler quickly discover this maki.What has Georges a long crackling tail, very soft but handy to drag Georges along. Hocus pocus and he conjures a rabbit out of his pocket. The lion is transformed by a rattle, a tap on his head and you hear a bell sound. What else do you think of Georges de ma..
LilliputiensLilliputiens Georges little seatThis Lilliputiens chair with maki Georges the monkey is super nice. 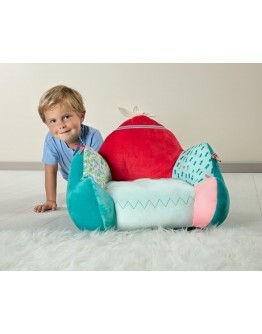 You quickly feel like decorating the room of your son, which makes this seat a must have for the children's room. 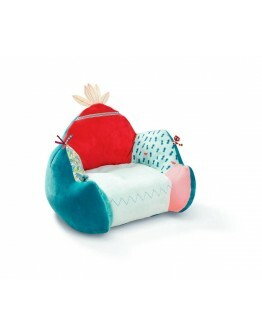 This colorful and soft little chair from maki the monkey Georges is finished with beautiful feathers. 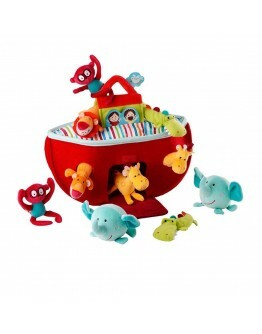 Enjoy together with a book by Lilliputiens Georges the maki monkey in your little seat.Starting from + 6 m Size 55 x 45 x 40 cm Material 100% polyester Washable at the surf..
LilliputiensLilliputiens Arch of Noah blueLet all these Lilliputiens Arch of Noah animals, get on the arch side by side and by two and let them find shelter during the great storm surge. And this while Noah looks at all animals. 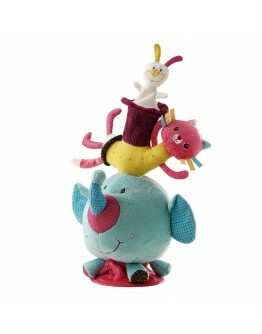 This Noah's arch blue with animals is easy to carry by your little one. It has a convenient handle and open the boot easy aside. There is also a mirror present. 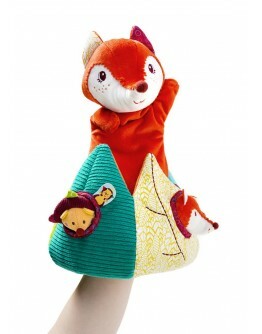 Starting from + 18 m Size 32 x 18 x 12 cm Material 100% polyester Machine washable 30°C (delicate cyclus)LOOK..
LilliputiensLilliputiens Alice action foxLilliputiens Alice action fox.Alice the fox with all kinds of action toys seems very hard on an Indian, yeah she has faded that sweet fox of Lilliputiens.Mirror, bell, teether, paper sound ... Alice has a lot of activities with which she can please your little one and make you laugh. For example Alice has a bell and a teether, a pwet sound and a rattle, a teether and a pacifier holder, a mirror to admire and a piece of paper that makes a sound. Go and dis..